It's been nearly 8 years since Jackass 3D and now Johnny Knoxville is back to his daredevil roots in the trailer for Action Point, which hits theaters June 1st. Fans of the Jackass franchise got their hopes up about a possibility of a 4th movie when Knoxville posted a picture of himself with Wee-Man and Bam Margera. It was the first time that he and some of the crew had been in the same place in 7 years, since the filming of Jackass 3D. However, there has not been anything mentioned about a proper reunion and 4th installment since then. For those looking for the same kind of stunts as Jackass, Action Point should quench some of that thirst. The movie has real-life stunts mixed with acting in a real storyline. The trailer begins with Johnny Knoxville in heavy makeup to be an old man again, much like Bad Grandpa, but he's telling the story of a crazy theme park that he used to run to his grandson. This theme park was not like any other place on earth. Jackass co-star Chris Pontius joins Johnny Knoxville in their quest to turn their camp into an insane amusement park, which highlights some of the crazy real-life stunts that they went through to make the movie. One of the most notable is Knoxville getting thrown into a bar from a huge catapult while Pontius gets a squirrel to go up in his shorts. It has some of the same gags and that iconic Johnny Knoxville laugh after getting really hurt, but it all seems to work and looks like a different project than anything he's ever done before. Action Point is directed by Tim Kirkby (Brockmire) with a screenplay by Silicon Valley writers/producers John Altschuler and Dave Krinsky. Mike Judge even has some writing credit in the new comedy. 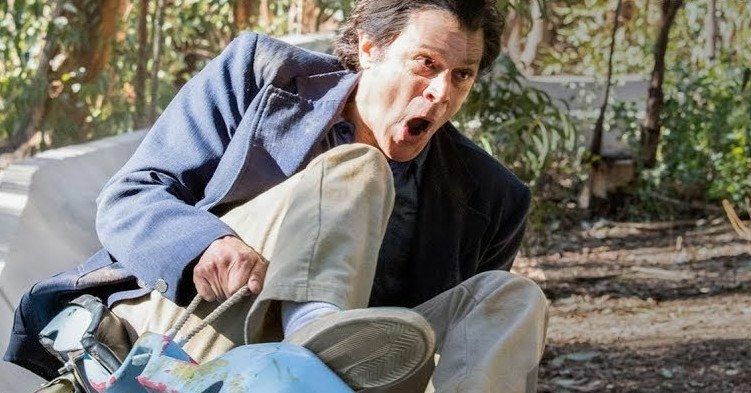 The trailer for the movie is full of the gags that you would expect, but it looks fresh and even a little bit darker from what we're used to seeing from Johnny Knoxville, who's looking almost like a real-life grandpa in the movie. As Knoxville explains, "What this place needs is an excitement enema. We're gonna make this place fast and loose," and that's exactly what the trailer for Action Point looks like. While Jackass 4 probably won't ever happen for various reasons, it's nice to see Johnny Knoxville and Chris Pontius back together. And who knows, maybe the picture that Knoxville shared with him, Bam Margera, and Wee-Man was from the set... That's speculation, but you never know with those guys. For now, we have the trailer for Action Point and it looks like a crazy amount of fun, which is sure to be needed amongst all of the heavy action going down at the box office this summer. You can check out the brand-new trailer for Johnny Knoxville's Action Point below, thanks to the Paramount Pictures YouTube account.